We have been working on several different projects that are now becoming tangible, which is very exciting. We will be presenting at the Inaugural Symposium of the UC San Diego Center for Healthy Aging on either our Healthy Aging projects or our Neighborhood assessments this Thursday, May 26th. Nancy and I are organizing a senior prom for elders at Gary and Mary West Senior Wellness Center as our project. 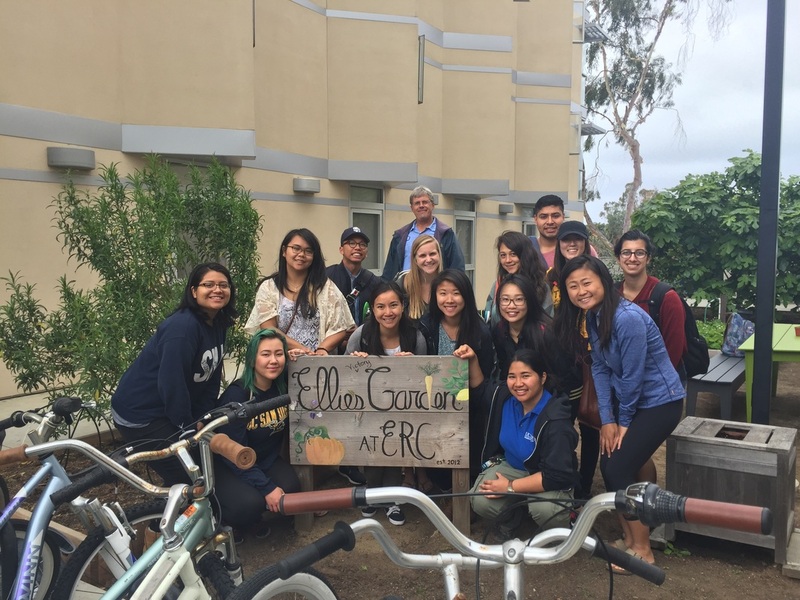 Previously in Life Course Scholars, we visited the communal garden in ERC and shared our neighborhood assessments. I did not know that this existed, so it was a very enriching and enlightening experience. I loved how material that had various uses around the campus was repurposed. For example, cement garbage bins were made into giant pots for plants. The repurposed material and joint effort towards creating a greener community transformed this space into a great place for quiet contemplation. Access to gardens has healthy benefits for seniors by keeping them active. Intergenerational gardens offer a healthy outdoor activity and an opportunity to engage with younger generations. Last Friday, we presented our findings from the neighborhood assessments conducted in Hillcrest, Pacific Beach, and Barrio Logan. During the presentation on Hillcrest, it was noted that the green space was limited and the crosswalks did not provide adequate time to cross. In our neighborhood assessment of Pacific Beach, we found that there are many green spaces, such as Kate Sessions Park, Law Street Park, and Fanuel Street Park, there lack public toilets both indoors and outdoors. We also noted that there were bus stops every two or three blocks and the majority of sidewalks are wheelchair-friendly (i.e. dropped curb to road level). From these various interviews, projects, and activities, I have learned about the diverse range of factors that contribute to healthy aging from dancing to the built and social environment to mindfulness meditation. The challenging part is now addressing how we will move forward to support these factors and enact positive change for elders in our society who are often neglected. On May 13, our class kicked off to a great start with Ellie's Garden tour led by the Healthy Aging Initiative collaborator, Chris Johnson. He was very knowledgeable and involved with the student gardening here at UCSD. What I found super interesting was that some of the benches, rocks, and trash cans around campus were re-purposed in the ERC gardens. Since UCSD replaced most of their trash cans with the solar powered bins, the old trash cans were of no use. However, they became the pots for the plants in Ellie's garden, which I thought was very neat and resourceful. Why is gardening good for us? I could not agree more with the therapeutic part of gardening because going on this mini tour was very relaxing in the midst of midterms and projects piling up. Next, we had a Mindfulness Meditation session led by Luis Trumi, who held a session back in winter quarter. He reminded us of what mindfulness meant- the practice of cultivating our awareness of the present moment- and had us do some mindful breathing as well as walking. I'm very thankful for Luis in taking the time to do some mindfulness meditation with us because I found it very therapeutic and de-stressing. Our day concluded with a delicious meal at Green Acre, which serves various kinds of foods made from farm to table organic ingredients. The foods were grown in a nearby garden located just outside the eatery. It was such an eventful day and I could not imagine spending my Friday morning any other way. Thank you Professor Lewis and Professor Bussell for planning this! Technology--making our lives easier and connecting us all- or so the common phrase goes... To what degree does this statement hold true when considering not only access and understanding of these technologies amongst elders, but also in their effect on intergenerational connections? I was really prompted to reflect upon this after my conversation with O.S., a recently retired woman I met last Friday at the Gary and Mary West Center. Our discussions at the center last week were focused on the age-friendliness of San Diego--examining what factors either facilitate or hinder health and well-being. The World Health Organization has laid out a set of eight determinants in assessing age-friendliness in urban life including: outdoor spaces and buildings, housing, civic participation and employment, community and health services, transportation, respect and social inclusion, social participation, and communication/information. In hearing her critiques of these factors, I found not necessarily the characteristics of San Diego, but rather national changes in technological culture to be a surprising underlying connection in concerns she had with the surrounding environment. O.S. expressed concern that there is an increasing lack of respect for the elderly. She highlighted this through repeated encounters of people not giving up their seats on the bus. She described a bus I have seen daily--a collection of millennials engrossed in their phones--all in the same physical space, but each in their own world. Among younger generations, phones and laptops often seem as though they have become extensions of our bodies. While information and answers are at our fingertips and connections can be maintained with people across the globe, basic human acknowledgement and connection with the people sitting or standing next to us I worry is being lost. A device that is to give freedom, in my opinion has become a new sort of leash. Because messages can be sent instantaneously, responses are also expected instantaneously. While this is helpful at times, it also means one is never disconnected from work or other obligations. This difference in communication in the digital age is also reflected in changes O.S. pointed out feeling in terms of social inclusion and participation. As a woman of color growing up during the civil rights movements of the 1960s, she described differences she finds between today’s forms of social activism compared to those of her era. While I would argue that there is much going on, like the black lives matter movement for instance, I can see that large social movements don’t often take on the same public display. O.S. feels that activism today has lost the same degree of group solidarity. To a large degree, I can understand why she feels this way. Group platforms and campaigns today are largely through social media--disconnecting those who do not have access to or know how to use such devices or platforms. Launching off a similar thread as Sandra, I feel elders who participated in activism have much that can be shared with younger generations. This new use of social media and technology as the main platform however cuts many of these elders out of the conversation. There has been much debate actually amongst sociologists as to whether movements and social “inclusion” through social media platforms are as effective. While they reach a broader span, there is less commitment and motivation required. In an recent article in the New Yorker, Gladwell reflect on this issue of activism through social media arguing that people are only motivated to do things on social media when they don’t want to make real sacrifices. When discussing the other eight factors with O.S., I realized the extent to which there is an expectation that everyone has access to and understand how to use the internet. For example when discussing access to health services, O.S. expressed her frustration in the fact that she is often expected to schedule appointments online. Nearly all job applications are also online, as well as housing applications. Public transportation is another thing that often expects the use phone apps for example to understand how to get places, particularly when many transfers are involved. While many would argue technological advancement is inevitable and we must keep up or fall behind, it is important that there are programs available. The Gary and Mary West Center does provide a computer lab and has high school students come in to help the elders learn how to use the internet. However, teaching doesn’t do much when many of these elders can’t afford to get phones or computers or change their desire to join this new wave that is latched on these devices (can’t blame them). It is part of the responsibility of city planning I believe to ensure that programs and services are made clear in physical public displays and not merely on internet devices. As discussed earlier, it is also extremely important that there are available spaces for intergenerational communication. Round table discussions have actually been started by a fellow student in the public health department. These roundtables are generating some interesting conversations and are hopefully helping to maintain those intergenerational ties that I worry are being lost with advancing technology. I've been thinking a lot about aging in all aspects of my life (unsurprisingly since I'm now in two classes focused on it). Most particularly, though, I've become most preoccupied with the passing, sharing, and co-creation of knowledge and skills that happens among folks of different ages and experience levels. For the past two years of my time spent at UCSD, I've become intimately involved with the student activist community. I've documented and archived stories of students past, of students who cared deeply for our campus to sacrifice so much - their time, energy, emotions, tears, labor... to the extremes of academic probation and dropping out. These patterns aren't a thing of the past, however. From my experience, the folks I know involved in student organizing often are struggling to stay in the university and keep up with their academic work. How would connecting the student-activists today with older folks who, once upon a time, were once in their shoes, affect the way students conduct their activism? How would a long-term perspective on lifelong organizing affect the way today's younger generation in their own work? Would this decrease the amount of crises that seem endemic to the community? I see in stories like Z's, the future of my friends and others I know. I believe truly that connecting younger students with older folks might stave off the mistakes of the past, and contribute further to new ways of envisioning a more just future. We started the LCS program by reflecting on how we imagined our lives to be when we were eighty years old. My first thought was “Well, I hope I'm still alive when I'm 80”. I don’t have to look far into my family tree to see that genetically I’m predisposed to heart disease, hypertension, and diabetes, to name a few. That prompted to reflect on my life choices now and how they may or may not be fueling that predisposition. One thing that I’ve come to realize is that aging begins earlier than we think. The choices we make when we’re twenty years old will affect us fifty years down the road. We’re not invincible. Another part of this assignment was to imagine what we’d be spending our time doing. The consensus was that we all wanted to spend our days working in our community and with our families. No one really mentioned anything about degrees or jobs, which is almost the opposite of what most college students are thinking about right now. This assignment helped me put into perspective where my priorities lie and how my actions now might be leading me away from how I imagine my life to be down the line. I met Miguel at Gary and Mary West’s senior center. The oldest of his brothers, Miguel went to work at a young age and spent most of his spare time working. He looked forward to Sundays because his mother stayed home to work around the house. He worked in factories most of his adult life. He was injured during one of his first factory jobs in the U.S. and had trouble finding a stable job afterwards. He shared with me that his mother worked hard to support their family, he never met his father. He came from Mexico when he was about twenty years old pursuing the American dream. He left behind his family and his girlfriend. Miguel shared with me that his girlfriend changed his life because she helped him open up to people. As I listened to Miguel share his story, I realized how important senior centers can be to elders because it gives them a space to engage with other people at least temporarily. Someone is able to check on them at least for a bit, make sure they're fed and doing alright. The last senior center we visited was Casa de Manana right alongside La Jolla Cove. The drastic difference between this center and the others we visited was unbelievable. The very first thing I noticed was the lack of an antiseptic scent. I could tell right away that this was a place where wealthier elders retired. There were no crowds of elders lined up waiting for food, in fact we only saw a handful of them. There was a heated pool, a newly designed home theater, a library, everything that all senior centers should have really. I felt almost sick walking around in Casa de Manana. It is unfair that St. Paul’s and Gary and Mary West’s senior centers can’t provide their elders with the luxuries found at Casa de Manana. The idea that low-income folks don’t need to have the nice things that higher income folk can get. We see this in our healthcare system, when you compare Obamacare and privatized insurance. Obamacare is a system that on paper sounds appealing, but in reality is a disjointed system that fails to meet the needs of the people it is intended to serve. The application process is difficult to access and social workers are almost impossible to get a hold of. But someone that can afford private insurance might not be on hold for thirty minutes to try and get some information. I think it's important to analyze the services that are being offered to low-income and high-income folks because we can always find ways to make them better. It would be disservice not to do so. ​On our last trip to the Gary and Mary West Senior Wellness Center, we were given the opportunity to interview elders about their aging experience. As the interviews progressed, I realized that I didn’t need the list of questions I had come prepared to ask. The questions began to flow naturally as the conversation gained momentum. The first gentleman I interviewed, we’ll call him Alex, was born in Ethiopia and moved to America in 1982. He surprised me in many ways. He writes in 4 different languages: Oromo, Amharic, Arabic and Harari. He has always enjoyed composition. He moved because he wrote against Communism. Once in America, he started to heavily drink alcohol. He admitted to drinking 10 bottles of malt liquor beer everyday until 2009 due to his health. His experience in San Diego has been somewhat tumultuous. He said that it has been difficult to find a job here and he has experienced discrimination. He plans on leaving San Diego for Florida where he may be able to get a job at a convenience store. The second gentleman I interviewed was the same senior that I bonded with previously and he is mentioned in my last blog as Joe. Joe said that he is currently the happiest he has ever been. He enjoys aging as a man because women can be too concerned with their self-image. As women age, he noticed that they still try to look attractive. I connected what Joe said in this conversation to the seminar book I read, The Cultural Context of Aging: Worldwide Perspectives. One of the chapters discussed various definitions of successful aging. A marketing agenda has developed where companies have tried to link successful aging with antiaging. This type of link demonstrates the fault in our culture regarding aging. Instead of trying to avoid the process of aging, aging should be embraced as a time of continued active and meaningful engagement in society. In fact, both of these gentlemen revealed that they feel the healthiest they have ever been in their life! While this may not be the case in reality due to life burdens and cumulative effects, Alex and Joe demonstrate the power of positive thinking on health. From these two interviews alone, I learned that there is a great deal of individual variation in the rate of aging and the physiological processes related to it. Joe is older than Alex, but you probably wouldn’t be able to tell just by looking at their overall health. While Joe grew up relatively well-off in a stable household and admitted to investing his money well as an adult, Alex told me of his lifetime experience working as a custodian and dishwasher. The physical and social environment and the structural factors in those environments had a formative effect on their sense of selves and their sense of self-worth. Joe knew his potential and was proud. In contrast, Alex grew up encountering discrimination his whole life. When asked what makes him happy, he said that he is happiest when people see others as equal because discrimination makes him tired. Ultimately in their efforts to focus on the upside of aging, I believe Alex and Joe have achieved successful aging. My name is Anna Dominguez and I am a fourth year at UCSD majoring in Pharmacological Chemistry with a Health Care Social Issues minor. What initially interested me in the Life Course Scholars program was the idea of giving back to a community and population close to my heart. Having both my parents (in addition to many aunts and uncles) in their late 60’s to 70’s, I find myself constantly surrounded by an older generation at home. While also being the daughter of immigrant parents from the Philippines, I thought it would be interesting to be able to compare and contrast different viewpoints of aging throughout different cultures. In addition, I would also be able to share the experiences that I gain from the program with my own community and those closest to me at home. In these past few weeks, one thing that I have found about working with the elderly population is that it always comes with lots of wisdom and life lessons gained and I can’t wait to share these tidbits of wisdom and knowledge with you all through these blogs! As already mentioned by my fellow life course scholars, we started out this program with a journaling exercise of where we saw ourselves at 80. This exercise was a tough one. Although as college students, we often get asked the questions of “Where do you see yourself in 5, 10, or even 20 years,” never have I ever stopped to think where I would see myself in 60 years. I didn’t know where to start. I first thought of location--where would I want to live? and with whom? I imagined myself growing old and living with a significant other in a home we’ve shared many memories in-- something along the lines of Mr. and Mrs. Fredrickson of the movie Up. Then I thought of what I would want to be doing with all the free time on my hands as a retiree. Since I am constantly worrying about not doing enough with my time now as a college student, I had no doubt I would feel the same worry when I am 80. I modeled what I wanted to be at 80 after one of my aunts who has been retired for 10 years but still lives an active, healthy lifestyle. Her jam-packed days consist of helping out at the local church, gardening at a community garden, walking her two dachsunds everyday around the neighborhood, and taking senior ukulele classes. She goes to show that learning and staying active should never stop when you retire-- it is merely is a life-long activity and process that keeps our own selves happy and healthy. There is so much to be learned and so much to do, so why ever stop? I then came to a realization that the biggest determinant of whether or not I would be able to do all of these activities at 80 was was my health. Health is everything. When I am 80, I hope to be living a healthy lifestyle in a world where 80 may be the new “30”. Overall, this exercise really opened my eyes to how the aging process works—it’s a continuum, it’s a life course in its entirety, and there is so much to learn from it along the way. In addition to learning so much from these exercises, I’ve learned so much from the elder-partners we’ve had the fortunate opportunity to meet and speak to over the past few weeks. By being able to talk to a wide range elderly partners from the multiple PACE sites and the Gary and Mary West Senior Center, I’ve personally observed that although each individual had their own respective “life story” to tell, none of their stories were nowhere near being done, whether they were in their late 60’s or early 90’s. Many of these elderly folks still had goals and aspirations that they still wanted to accomplish. This served as a testament to the idea that no matter how old you get, you’re never too old create new “life goals”. For example, one elderly women in her mid-70s at the Gary and Mary West Senior Center shared with me that one of her personal goals was to start a senior “make a wish” foundation to grant each senior a trip to wherever they would like. Her goal was to go to travel to Washington DC and see a poetry piece of hers she claimed to be up at the National Museum. Another individual in her late 60’s shared with me that she has been working on an article to be published in Essence magazine regarding her struggle as an African American woman having to “prove herself” in many male-dominated jobs in the course of her working career. Another elderly man in his late 60’s from PACE had goals of staying as active as he can both mentally and physically regardless of his disability after having had one leg amputated and struggles with PTSD. Although many of these goals are vary depending on each individual, talking to each of these people made me realize that having something to strive for is what keeps us all living. It doesn’t matter if we’re 5 or 95. One secret to healthy aging is to keep on aiming for the short term and long term goals we all have in life. It’s what makes us who we are and makes for some incredible stories to tell afterwards once those goals are accomplished. Overall, I’ve really enjoyed the past few weeks and love the group of people I am able to share all these experiences with every Friday. I can’t wait for what the next few weeks and next quarter has in store! ​G was born and raised in New Orleans, Louisiana by her grandparents. They instilled in her a deep sense of respect and deference for elders as she grew up - something she observed is a trait that young folks today, in her experience, tend to lack. A high school graduate, G deeply enjoyed school. For example, she told me of one musical she participated in during this time; her enjoyment of song and performance carried over throughout her entire lifetime (she later invited me to watch her sing America the Beautiful in April at the center). G enjoyed school so much that her dreams consisted of one day becoming a teacher herself. This never materialized, however. G's relationship with her husband significantly impacted her. G met him during high school, later marrying him at 27. G's husband joined the military, and she told me of living in Germany, Virginia, Texas, among other places. At some point, they almost bought a home in Texas, but G's husband came back from the Vietnam war with unresolved trauma issues. His mental anguish from the war resulted in physically abusing G. After the first incident, G had enough of his abuse, leaving him and packing up for California. Here, she's stayed for 24 years. My name is Allison Celeste Pineda. 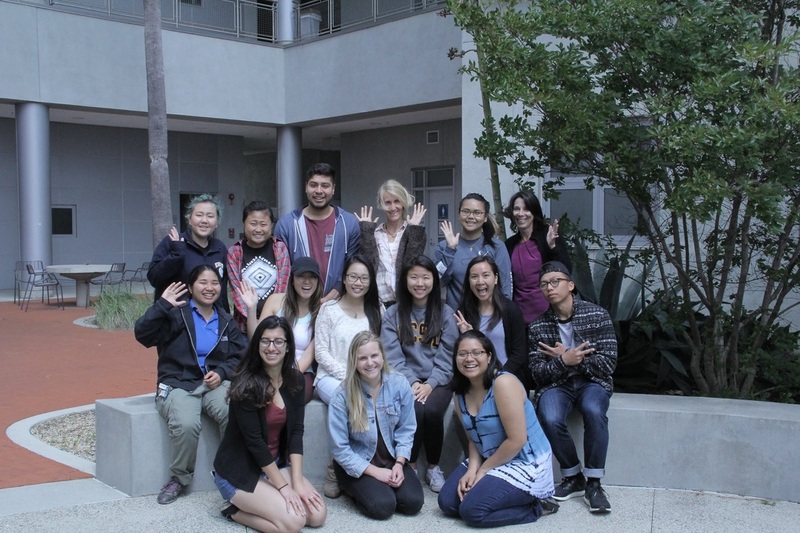 I am a fourth year Public Health Major from Revelle College at UC San Diego. When I first came to UC San Diego, my dream was to become a doctor. More specifically I wanted to become a doctor that opened free clinics and made health care more accessible to patients. One day, someone pointed out to me that I may actually be interested in public health. I took a public health and global health class when I studied abroad in South Korea and I immediately fell in love with the topic. There are times when I question whether changing my major so late in my college career was a good decision. But then there are days that I come to lecture and am brought to tears because I feel so passionately about making a change, I know that I made the right decision. When I heard about the Life Scholars Course, I felt like this was an area that this was an area that I wanted to learn more about so that I can make changes that positively effect people's quality of life when they become senior citizens. At the beginning of this course, they asked us to describe what our lives would be like when we are 80 years old and what would need to happen in our lives to achieve our ideal 80 year old selves. When first posed with this questions, my thoughts immediately went to my Hip Hop dance instructor who earlier that week had told us, "I still want to be dancing when I'm 80, and in order to do that I need to stretch." For some reason these words echoed in my head while thinking about the assignment. Initially, I wrote that I hoped that I had invested in my relationships with my friends and family enough so that I would not be alone by the time that I reach 80. At the time, I did not really reflect on why I was so afraid of being alone at the age of 80 but I realized the answer when speaking with some elders from the Gary and Mary West Senior Center. When I was speaking with some of the elders as they ate lunch, they told me about their children that lived in the San Diego Area. When I asked if they saw their children often, they replied that they did not and I decided not to press further with my questions. Their response made me think of my great-grandma who is currently living in a convalescent home. My grandma was born on February 29th, 1920. Although technically she was born 96 years ago, if one were to follow strict birthday rules, she will be turning 23 in a few days. My great-grandma is the woman who brought my mother to the United States from the Philippines. Without her, I would probably not be here. My great-grandma lived completely independently until she fell and hurt her hip a few years ago. Ever since then, she has lived in a convalescent home. I am not able to communicate with her because she mostly speaks Tagalog, but from the way that she carries herself and speaks with my mother I can tell that she is a strong and wise woman. Now that she is getting older, my family and I try to visit her as often as possible. However, with our busy schedule and the fact that she lives in Los Angeles and my family lives in Sacramento, it is very difficult to see her. Whenever we go to visit her, she always asks us if we are going to take her home to her single-bedroom apartment in Hollywood. I can tell that it hurts my mom every time that she has to say that cannot take my great-grandma home. These are the moments that flashed into my head when I was talking with the seniors at the Gary and Mary West Senior Center. When I reflect upon my initial answer to the "Where I want to be at 80 years old" question, I still want to have meaningful relationships. However, I no longer think that I will be able to achieve this simply by investing time in my friends and children. I realize that there needs to be a societal change of thinking. Although convalescent and nursing homes are great resources for elders who need consistent medical attention, taking elders away from their homes and communities can be devastating. In order for me to continue my meaningful relationships with friends and family when I am 80 I need to have the freedom and power to do so. My great-grandma invested time in her relationship with my mom and uncle, which is why they come to visit. But my mom does not have the power to take her out of the convalescent home and my great-grandma does not have the power to leave. Although I understand that she needs to stay there to receive care, I also know that she wants to feel independent and to reconnect with the community that she was a part of before she was put into the convalescent home. This year my great-grandma will turn 23. In two years, I will be the same "age" as her. If I am blessed to live as long as my great-grandma, I hope that the way society views seniors will change from dependent patients to independent elders with power to make their own decisions and wisdom to share with the younger generations. Hello! My name is Amanda Chao and I am currently a fourth year UCSD student majoring in Public Health. I am an international student from Hong Kong, and this background lead to my interest in comparing the elder care system between Hong Kong and the United States. I have visited senior care centers in Hong Kong before, and this program gives me the opportunity to explore the elder care facilities that are located in San Diego County. In the first visit, our team went to St. Paul’s PACE and Intergenerational Childcare-Adultcare Center. These facilities provide free medical, social, and home care services for individuals over 55 years of age who are with low income and limited ability to pay for health coverage. I am pleased to see that although the facilities targeted to serve the lower income population, the built environment does not create a stigma of poor quality. The do provide clean, comfortable environments and have adequate health care facilities for the elders who are in need. In St. Paul’s PACE, I was paired up with a lovely old lady, Lorraine, she is in her late 70s and have physical disability. She also has difficulty in speaking due to the gunshot in her head when she was 35 years old. Although of all these unfortunate and difficulties, she was open and cheerful enough to share her life story to me. During our conversation, she sometimes frustrated by herself of not being able to remember a certain word or a certain event; in order to sooth her, I patiently listen to her and help her complete her sentences. I was surprise when the staff in PACE told me that Lorraine wrote a book, "My Life," a book that contains her old journals and old photos. After she showed me, my reaction was “Wow!” She even has her baby pictures in it! The book documents her life journey, from when she was born, at school, graduated, into marriage, at work, and to the time she started to loss her ability to write and now sitting in a wheelchair. From this sharing, I learnt the struggles of aging, and most importantly I see the changes of the stages of life; she was once at the same age as me, having all the dreams and goals in her life, having the ability to take care of herself and even others, but now she is helpless in a wheelchair and is depended on others for help. Through this reflection, I learnt that it is our turn to take in the responsibility of helping the vulnerable elders. We should because we have the ability to do so! Through this Life Course Scholar program, I am able to have more direct contact and interaction with the elders. I can recognize their psychological and physical struggles of aging after interviewing them. It is important to encourage younger generation to interact with elders and reduce the generation gap that think old people are boring, outdated, or not worth listening to. I love listening to elders’ life stories; I admire them when listening to them. For me, they are the life mentors!